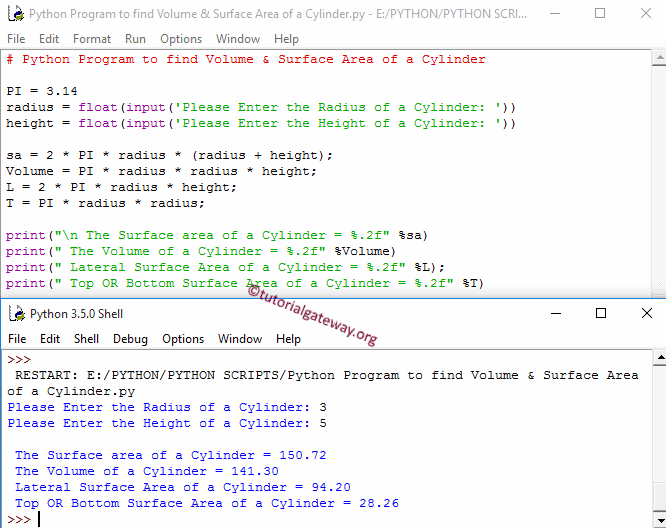 In this article we will show you, How to write Python Program to find Volume and Surface Area of a Cylinder with example. Before we step into the program, Let see the definitions and formulas behind Surface Area of a Cylinder, Lateral Surface Area, Top or Bottom Surface Area and Volume of a Cylinder. Surface Area of a Cylinder = 2πr² + 2πrh (Where r is radius and h is the height of the cylinder). This Python program allows the user to enter the value of a radius and height. Using these values, it will calculate the Volume of a Cylinder, Surface Area of a Cylinder, Lateral Surface Area of a Cylinder, Top Or Bottom Surface Area of a Cylinder as per the formula. First, We declared PI variable and assigned the value as 3.14. NOTE: For the calculation purpose we have taken π = 3.14 instead of (3.142857142..). So, All the above values are almost equal to program output but may differ at 0.01. This program allows user to enter the value of a radius and height. We will pass the radius value to the function argument and then it will calculate the Volume of a Cylinder, Surface Area of a Cylinder, Lateral Surface Area of a Cylinder, Top Or Bottom Surface Area of a Cylinder as per the formula. First, We imported the math library using the following statement. This will allow us to use the mathematical functions like math.pi. If you fail to include this line then math.pi will through an error. Step 2: We defined the function with two argument using def keyword. It means, User will enter the radius and height of a Cylinder.